With the warm weather on its way, it’s time to start thinking about how great it is to spend time outdoors in the yard during the summer months. Unfortunately, with the nice weather also comes the ticks and mosquitoes that can not only ruin your barbecue but also carry potentially deadly diseases. 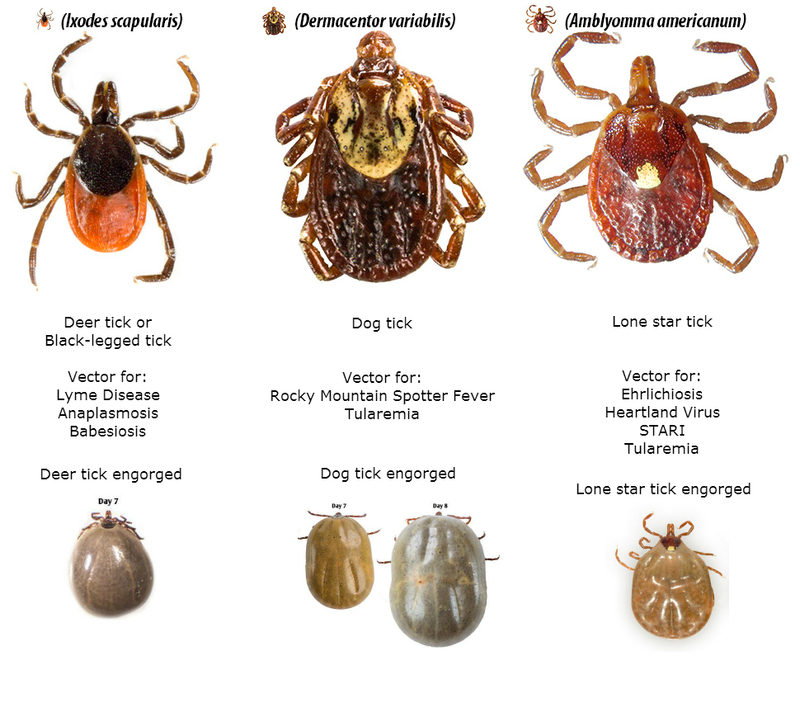 Ticks are found in densely wooded areas and like to hide out in tall brush. The average yard on Long Island provides the perfect habitat for ticks. 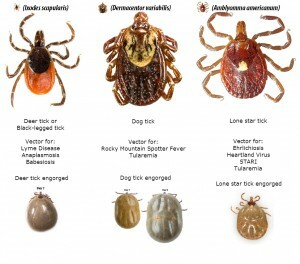 Every year we see more ticks spreading diseases, many of these are difficult to diagnose and treat. Powassan virus now joins other, more common tick-borne illnesses already present in our area. These include; Rickettsia parkeri rickettsiosis, Anaplasmosis, Babesiosis, Ehrlichiosis, and Lyme Disease. Take ticks seriously and consider doing more to keep you and your family safe from them, because what you’ve been doing may not be enough. It is imperative to spray for ticks before the ticks arrive. Mosquitoes are not only annoying, but they can also carry diseases such as West Nile Virus and Zika. These pests breed anywhere where there is standing water. Just an inch of water can breed hundreds of mosquitoes. The best thing you can do for mosquito control is tree spraying. There are plenty of organic insect control compounds that kill the dangerous insects but are safe for your family and pets. Discuss your tree spraying schedule early to ensure a happy, mosquito-free summer. Scheduling regular tree and yard spraying for ticks and mosquitoes can help you take back your yard from these devious pests. Call Aronica Plant Health Care today and keep your family safe. Spring is around the corner and now is the time to get your garden prepared for spring and summer planting. Here is a list of things that can be done to make sure you get the most out of your planting season. Summer-flowering bulbs such as Lilies, Gladiolus and Ranunculus can be planted in early spring for a colorful summer display. This was quite a windy winter, remove leaves and other debris from your flower borders, lawns and ponds. You can cut back the old dead growth of deciduous grasses and perennials now to get the task out of the way. If the soil is workable you can dig a 5cm layer of organic matter such as well-rotted manure, compost or recycled green waste into empty garden borders. Hunting down and removing hibernating pests now can save a lot of trouble come spring and summer. Take a closer look at the crowns of your perennial plants and you may find slugs, snails and aphid colonies sheltering for the winter. If you still haven’t cleared last year’s pots of summer bedding then do this now and be on the look-out for the white vine weevil larvae, which live in the compost and feed on plant roots. You can also schedule preventative pest control with Aronica Plant Health Care to keep pests out of your yard. If you have a deciduous shrub that you want to move then now is the time to move it while it’s dormant. When digging it up , try to take as much of the root ball as possible for the quickest establishment in its new location. When planting shrubs in their new position, place them at the same level they were previously in the soil, and remember to water them in well afterwards. Although it’s cold outside this is the ideal time of year to make sure your garden structures and tools are ready for the spring! 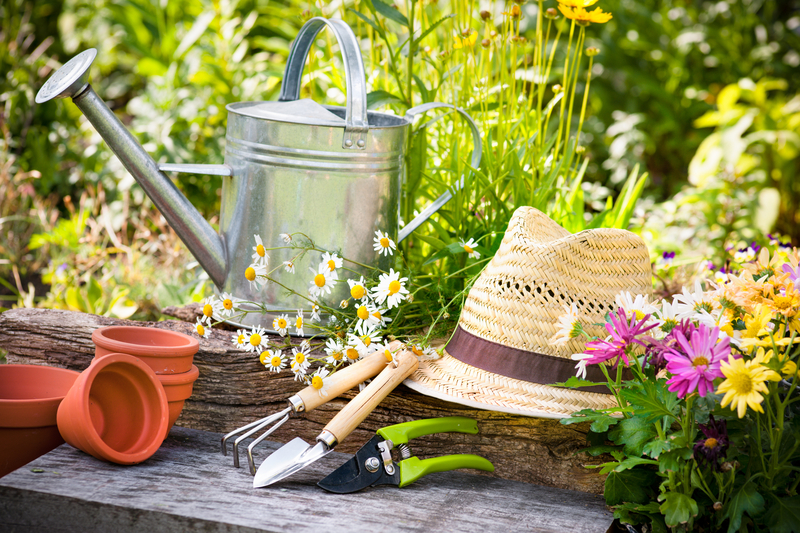 Any broken structures or tools are best fixed now so you have more time to spend in the garden during spring and summer. Treat your wooden garden structures with a wood preservative during dry periods. This is also a good time to give your tools a clean and a sharpening! Caring for your garden tools not only helps preserve them, it saves you money in the long run and helps prevent the spread of disease. 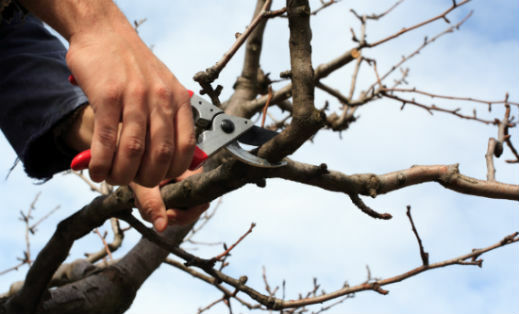 Dirty secateurs may introduce bacteria and fungi to fresh pruning wounds. Sharpening your tools will also improve their performance; they’ll be easier to work with and will give cleaner pruning cuts. While we often choose plants for their beauty, the most important part of a plant is where you can’t see. Roots make the plant, if a plant’s roots are sick, so is the plant. 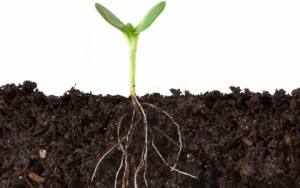 Roots provide the anchor needed to keep a plant in place. They are the lifeline of a plant, taking up air, water, and nutrients from the soil and moving them up into the leaves, where they can interact with sunlight to produce sugars, flavors, and energy for the plant. Roots also secrete compounds that affect the microorganisms in the soil, doing things like helping protect the plant from disease and encouraging it to absorb nutrients from the soil. Healthy roots should be white or tan, succulent, and numerous and long enough to hold the soil in the shape of the pot. Visible roots should be white. Roots that are brown and crumbly mean that your plant is unhealthy. Note: Immature plants have small roots that don’t hold the shape of the soil, this is okay and just means your plant is not ready to be transplanted. Want to have healthy roots? Remember seven words: “Healthy, deep soil. Adequate moisture and nutrients.” If everything you do in your garden works toward that, your plants should thrive. Healthy roots need a regular source of moisture, so make it a habit to water regularly. A good rule of thumb is to make sure plants get an inch of water per week through rain and/or watering. Loose soil, adequate water, and plenty of nutrients are the keys to healthy roots and productive plants. With winter comes ice and winter storms. 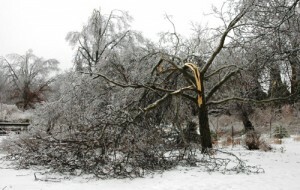 Unfortunately, these winter storms can wreak havoc on your yard, weakening your trees and damaging your property. There are steps you can take to secure your trees in the winter months to help mitigate the damage caused by old man winter. Plant only strong trees in your landscape. Certain trees are popular year in and year out for a reason – they show well and live well. Fast-growing trees are often more brittle and develop weak, V-shaped crotches that easily split apart under the added weight of ice. Because these trees usually take some damage from storms throughout the year, internal rot, decay and lead to weakened trunks and limbs. Brittle species should not be planted on sites where heavy ice and snow is a problem. Brittle species include elm, willow, box-elder, hackberry, true poplar and silver maple. Be wary of trees that keep their leaves later in fall in areas that are prone to early ice storms. Icy leaves put stress on limbs and branches causing potential damage. Wrap small multi-leader trees. If ice is predicted, secure the tree with strips of carpet or cloth two-thirds of the way up. Remove wrapping in the spring to give your plants room to grow. Start pruning when your trees are young. Prune dead or weakened limbs and excessive branches from trunk and crowns. This reduces ice weight that can damage your trees. Hire a professional arborist for particularly valuable, susceptible or large trees. An arborist can strengthen a tree by installing cabling or bracing on weak limbs. The tree experts at Aronica Plant Health Care can help you develop a winter action plan to protect your trees. The holidays are upon us yet again and don we now our gay apparel not only for ourselves, but our houses as well. Americans are projected to spend about $6 billion dollars this year on holiday decorations including outdoor holiday decorations. While some holiday lighting is tried and true: Twinkling lights. Front door wreaths. Towering trees, festooned with decorations, here are some of the hottest lighting trends for 2016 that might tempt you to hop out of your decorating routine to try something new. White lights have reigned for years, outlining roof peaks and twinkling on trees and shrubs, but this year, multicolored lights make a comeback! Kids love color, and families are including children more than ever in holiday decorating choices. Wow the kids with your most colorful display ever. Commercial properties that have relied on traditional white lights for holiday decor might catch the eye of new customers with a dazzling new light display packed with color. 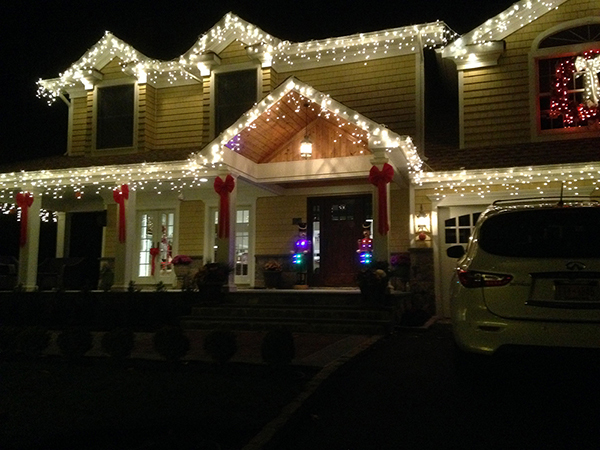 While white lights are classic and understated, multicolor lights shout festive and fun. These energy saving bulbs are becoming more popular than ever. Today’s outdoor LED holiday lighting offers a much more vibrant look than the colored bulbs from days of yore. Incandescent lights get their color from covering the white glow of the filament with colored bulbs. But the diodes of LED bulbs actually generate different colors on the color spectrum, so the color is more intense. If this is your year to switch to colored holiday lights, be sure to do it with LEDs, which are not only more vibrant, but use much less energy than your old strings of lights. An easy way to hop on the color train: Simply replace the white bulbs in your landscape lighting fixtures with red or green bulbs to wash your house in holiday spirit. There are many products on the market that project vast multi-colored light displays onto your home. Create the illusion of freshly falling snow, or have reindeer dash across your roof. These fun displays make for a great 21st century holiday. If you want your house to say Clark Griswold without having to sacrifice an entire weekend out in the cold, give Aronica Plant Healthcare a call and let us do the work! The weather has been unseasonably warm these past few weeks, but don’t let that fool you. 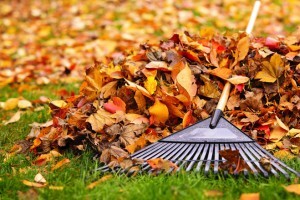 Winter is coming and there is still lots of work to do to prepare your yard and gardens for the upcoming cold months. Now is the time to fertilize your lawn. If you fertilize it this fall, when it’s still green, it will survive winter best and come back more vigorously in spring. Keep mowing your lawn to a 2½ to 3-inch height for as long as it is green. Don’t scalp it by mowing short while it’s still green. It’s also a good idea to aerate the lawn and to continue watering until it turns brown. Even then, water once a month throughout winter, especially if there is little snow. Insects that feed on your vegetables during summer and fall often lay eggs on the old plants so pull them up once you have harvested. If the vines are left on the soil surface, insect eggs will survive the winter and hatch in the spring! 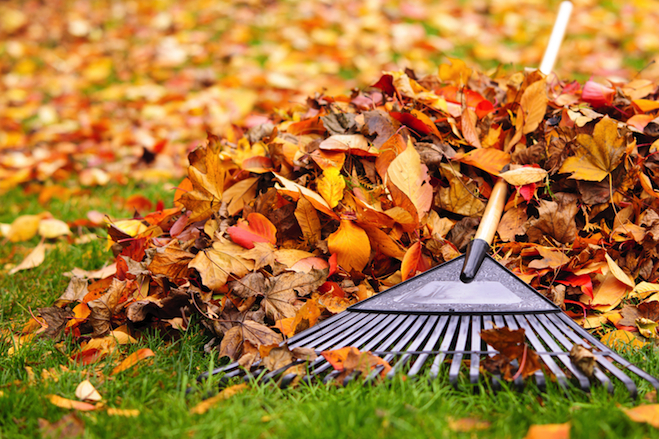 In addition to garden debris, other organic material may be added to the soil in fall to help it keep its nutrients. You can use well-rotted manure, compost, peat or leaves. For fall vegetables like winter squash and pumpkins, harvest them after the first light frost.. Do this before a heavy frost damages the fruits. Cut from the vines leaving 3 to 4 inches of stem on the fruit so they keep longer. Rip up spent vines and foliage of annual flowers and compost them or dig them into the garden, the organic material will help the soil. If the plants are diseased, however, discard them in the trash. Fall is the best time to get rid of weeds. Perennial weeds, such as dandelion, thistle and bindweed, are more easily killed by fall sprays than in the summer. So get down in that dirt and pull those weeds! Shorter days and falling temperatures are prompting deciduous trees and shrubs to drop leaves and prepare for winter dormancy. Limit fertilization in fall, as nitrogen stimulates useless late-season growth and delays dormancy which can damage the tree when the temperatures begin to drop rapidly. Do continue to water trees and shrubs through fall, sending them into winter with ample moisture. Dry soil kills roots and puts stress on trees and shrubs so make sure to water every three to four weeks. Water when temperatures are above freezing and when the soil is not frozen. Appling water early in the day will give plants time to absorb moisture before the soil freezes at night. Wrapping trees and shrubs prevents sunscald injury, a conditions that develops when the warm winter sun is absorbed by the plant’s bark. By the first of November, wrap trunks of your deciduous trees with crepe-paper tree wrap. Begin at the base of the tree and wrap upward, overlapping about a third of the paper with each turn. Stop when you reach the first set of branches. You can remove the wrap in April. As the season progresses and the weather becomes colder, mulch the soil around the plants. This is generally done in mid-to late November. It is not necessarily the cold that damages perennials in the winter, it is the fluctuation of temperature. Mulch keeps roots cold, not protect them from the cold. Use mulches that are light and won’t pack or suffocate roots. Apply to a depth of 4 to 6 inches. Make sure to water once a month if the winter is particularly dry. This year it is expected to be a pretty quiet hurricane season, but that doesn’t mean one shouldn’t be prepared. Tree damage is a huge concern with storms and although severe storms will always result in some uprooted and broken trees, thankfully some preventative steps can lessen the impact. 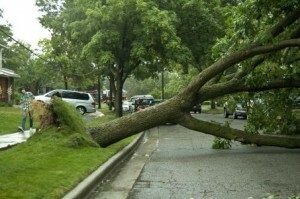 Knowing how trees fall victim to storms can help protect your trees. It is important the trunk and branches to be free to grow, but don’t forget the roots. Mature trees can grow roots extending hundreds of feet from the trunk and this root zone should be protected from compaction. Minimize foot and vehicular traffic which can cause damage to the root system. Planting shrubs or beds of native plants around young trees helps to prevent trampling. Plant trees when they are small. Smaller trees establish healthy root systems much more efficiently than larger trees. Remove the tree stakes quickly. Just like working out our muscles makes us stronger, allowing a young tree to flex in the wind results in a stronger tree. Plant trees in groups. Trees planted alone or in a lawn are more susceptible to wind damage than trees in groups. Groups of five or more trees planted ten feet or less from each other are 33% less likely to be blown over. The root systems will grow to interlock, reinforcing the roots of nearby trees. If you don’t have space for multiple trees, plant some large shrubs within a couple yards of any large trees you plant. Taking these steps early can help prevent tree damage way before a storm hits. If you have questions about keeping your trees safe during a storm call the experts at Aronica Plant Healthcare. Your garden bloomed into color in spring but now as summer begins to fade, you realize the plants don’t look as exuberant as they once did. Lower leaves are turning brown and dropping off. Spider mites are spotting the leaves. There’s less new growth. Those beautiful blooms are wilting in the heat of the afternoon. The fruit is ripening more slowly. Fewer new flower buds appear. The nutrients in the soil are being used up or washed away. Mature plants need more water. 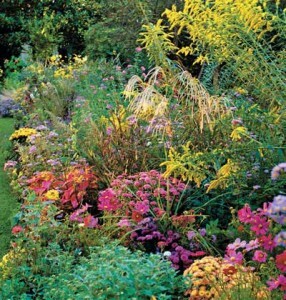 The late summer garden certainly requires more effort, but fear not, all is not lost. You can boost your garden back to life. As late summer and fall arrive, atmospheric humidity declines. This causes soil moisture to evaporate more quickly. Your normal watering routine from June and July just won’t cut it and will need to supplement with regular soakings to support your late summer garden. One way to supplement your watering is to set a dripping garden hose at the bottom of each plant for a couple of hours. Repeat this every few days. Try creating generous watering basins around the base of each plant. Make them big enough to hold a lot of water directly over the root zone so it may gradually percolate down into the soil. Soaker hoses and sprinklers will also help if left on long enough to penetrate deeper than the top few inches of soil. As time goes on the nutrients in the soil begin to get used up adding a second helping of fertilizer in August can make a big difference. Select a fertilizer carefully, too much nitrogen can sacrifice flower production. Rather than using a single form such as manure or compost, fertilizer blends that contain a diverse formula of minerals and nutrients. They are as easy to apply as any larger name brand. They are manufactured locally, so each region of the country will have its own brands. You’ll find them at quality garden centers. Keep watering and fertilizing your garden through the late summer and you will see your garden spring back to life. What’s with All of These Moths? Around this time of year, you may notice an abundance of moths when you’re out and about. You’ll see them stuck on windows and walls everywhere you go, and can’t seem to escape the seemingly endless swarms of them if you’re walking near trees. So what’s going on with all of the moths? The answer is easy! Lots of moths around now means there were lots of caterpillars around before! 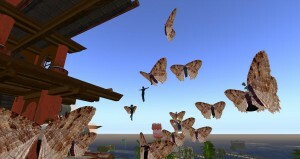 This spring there was a boom in the caterpillar population, so now we’re experiencing a heavy moth infestation. Called Winter Moths, they originally came from Europe. They most likely hitchhiked to New York by attaching themselves to crates containing imported products, and since they have no natural predators here, their population is swelling. The big problem comes in the spring though, when their caterpillars emerge and feast on leafy deciduous trees like maples, oaks, elms, and fruit trees. If it’s a weak stressed out tree to begin with, the caterpillar can kill it. Your trees are at a much greater risk now than they used to be, because in addition to the Winter moth, other tree munching species, such as the Gypsy moth have also experienced soaring numbers. Unfortunately, there’s nothing you can do to get rid of the moths now. Prevention is the cure, and the best cure is to spray for the caterpillars in the spring. Experts say these moths will be around through the end of December. To prevent a similar swarm from occurring again next year, you should schedule a tree spraying for early spring. Scheduling a spraying now will help make sure this doesn’t happen again next year. For tree spraying questions or if your trees have had damage by caterpillars call Aronica Plant and ask about tree spraying and tree care. Tree trimming and pruning is important for healthy trees. Although forest trees grow quite well with only nature’s pruning, landscape trees require a higher level of care to maintain their structural integrity and aesthetics. Improper pruning can create lasting damage or even shorten the tree’s life so tree trimming and pruning must be done with an understanding of tree biology. Increase light and air penetration to the inside of the tree’s crown or to the landscape below. Routine thinning does not necessarily improve the health of a tree. Trees produce a dense crown of leaves to create the energy for growth and development. Removal of foliage through pruning can reduce growth and stored energy reserves. Heavy pruning can be a significant health stress for the tree.